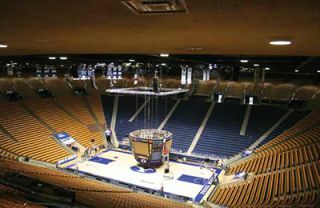 In April 2012, Brigham Young University’s administration announced that the Marriott Center basketball arena would shortly undergo a major renovation, including improvements to the installed sound system as well as seating changes and an extension to the men’s and women’s locker room facilities. L-Acoustics KARA main arrays with KIVA and KILO delays were installed in an upgrade of BYU’s Marriott Center. The new audio system, designed by BYU ’s staff with assistance from Salt Lake City-based Poll Sound, which also performed the installation, comprises a combination of L-Acoustics KARA main arrays with KI VA and KILO delays. Named in recognition of benefactor J. Willard Marriott, the hotel magnate, BYU ’s Marriott Center is one of the largest basketball arenas in the NCAA; indeed, it was larger even than any NBA arena when it was completed in 1971. Measuring 384 feet by 344 feet it remains the largest basketball arena in the NCAA’s West Coast Conference, and seats nearly 21,000 BYU Cougar fans (reduced from a former capacity of close to 23,000 with this latest, more spacious, seating reconfiguration). Brothers Brad and Troy Streeter, who respectively serve as BYU ’s campus multimedia engineer and audio production manager, designed the new L-Acoustics rig—using the manufacturer’s proprietary Soundvision 3D simulation software—in collaboration with Deward and Kale Timothy, also brothers, of Poll Sound, an L-Acoustics Certified Provider. “We put a dV-DOSC system into BYU ’s 1,200-seat DeJong Concert Hall with Poll Sound about four years ago, so we had a lot of confidence that a KARA solution would be ideal for the Marriott Center,” commented Troy Streeter. According to Deward Timothy, who started working for Poll Sound nearly 50 years ago and purchased the company from its founder, Harry Poll, in 1974, BYU did its due diligence for this latest project: “They had a shootout with various manufacturers and still L-Acoustics was the one that they preferred.” The upgrade encompassed only speakers and amplification with onboard DSP, as the console, a Yamaha PM1D, is not yet scheduled for replacement, Timothy noted. The four permanently installed center arrays each incorporate eight KARAi enclosures and two SB18i subs. In addition, four arrays each comprising eight standard touring KARA models plus two SB18 are installed on motors. Each array may easily be lowered and re-hoisted elsewhere in the arena, or may be combined with the permanently installed arrays to accommodate a wide variety of productions. All eight arrays are powered and processed by a combined total of 16 LA8 amplified controllers. Sixteen arrays, each configured with five KIVA enclosures plus a single KILO low-frequency extender, were flown in a symmetrical ring approximately 80 feet out from the KARA arrays in order to cover the upper bowl seating areas. These arrays are powered by 16 LA4 amplified controllers and delayed by 80ms. The installation also includes two additional clusters, each of five KIVA enclosures, positioned as downfiring constant curvature arrays to deliver energy to the arena floor. The reconfiguration of the arena’s seating, which has significantly expanded pricing options while lowering the cost of 75 percent of the tickets, involved lengthy construction work. With a hard deadline of the school’s August commencement service looming, Poll Sound, in conjunction with BYU ’s crew, had barely a week in which to perform the installation. Steve Harvey (psnpost@nbmedia.com) has been west coast editor for Pro Sound News since 2000 and also contributes to TV Technology and Pro Audio Review. He has 30 years of hands-on experience with a wide range of audio production technologies.